"Mama, I want pasta for dinner." "Well, we're having rice with peas and veggies..."
"Hoorah! Can you make it every night?" Phew. It's always a relief to figure out a veggie-packed meal that my son will actually get excited about. This dish is the latest hit in my house (we had it twice just in the last week). Being kid-friendly is not the dish's only good attribute. It is lower-carb and lower-calorie than many fried rice dishes because a good portion of the rice is "crowded out" by cauliflower rice. Now, if you're on a low-carb or paleo diet, you probably know all about this neat cruciferous vegetable trick. If you don't know about it, then prepare to have your mind blown, my friend. This satisfying dish is packed with nutrients. It is vegetarian but provides complete protein because it pairs rice with peas and sesame seeds; adding legumes and/or seeds to grains means you get the same essential amino acids that animal protein would provide. This meal has loads of Vitamin K, folate, Vitamin C, iron, calcium and fiber. So, it's not just good for your children, it's good for pregnant and breastfeeding gals, and parents who just feel like they could use more nutrient-dense—and simple to make—meals. One more benefit: this recipe is great when you're looking to clear leftovers from your fridge before they go bad. 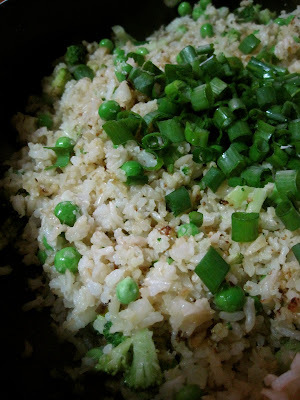 It uses cooked rice (I used basmati brown rice - it has a mild, popcorn-y flavor) and, although I used broccoli and peas, you can utilize whatever leftover or frozen vegetables you have on hand. I hope your family enjoys it as much as mine does! Remove the cauliflower's tough stem and reserve for another use. 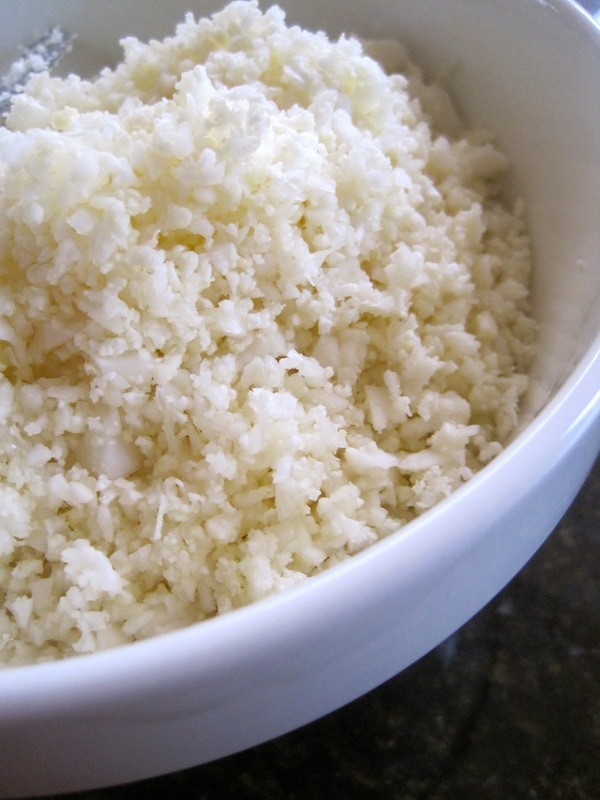 Using a food processor, pulse cauliflower florets until they resemble rice or couscous. 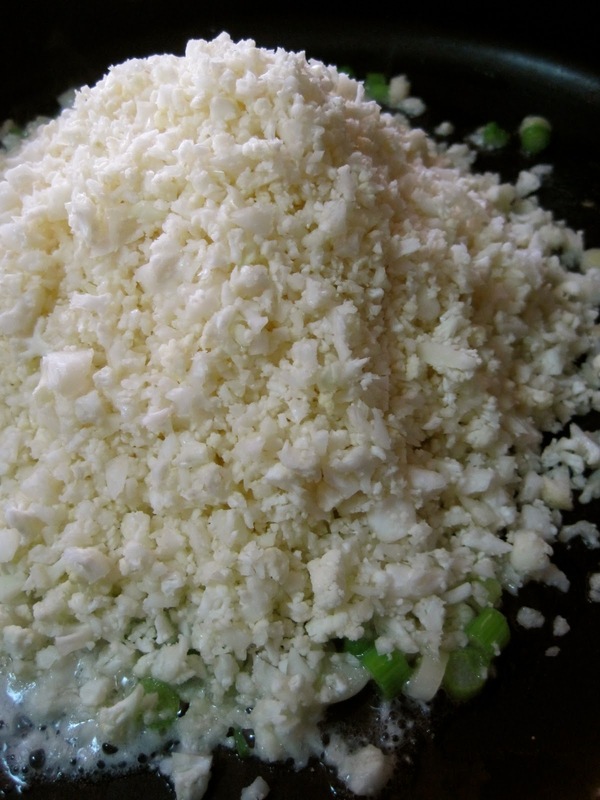 You should end up with around four cups of "cauliflower rice." This is raw cauliflower - would you ever have guessed it? Heat 1T butter and 1T oil in a large skillet over medium heat. Add garlic and the white and light green pieces of scallion. Sauté about a minute. Add the cauliflower to the pan. Stir to coat with oil, then spread out in pan and let sit; you want it cook a bit and to caramelize (get a bit brown), which will bring out the sweetness. After a couple of minutes, stir and spread out again. Add cold rice (it separates easily, so it won't clump up during cooking), plus the additional grapeseed and coconut oil or butter. Raise heat to medium-high. Toss everything together and, again, spread the mixture out over the whole pan and press a bit into the bottom. 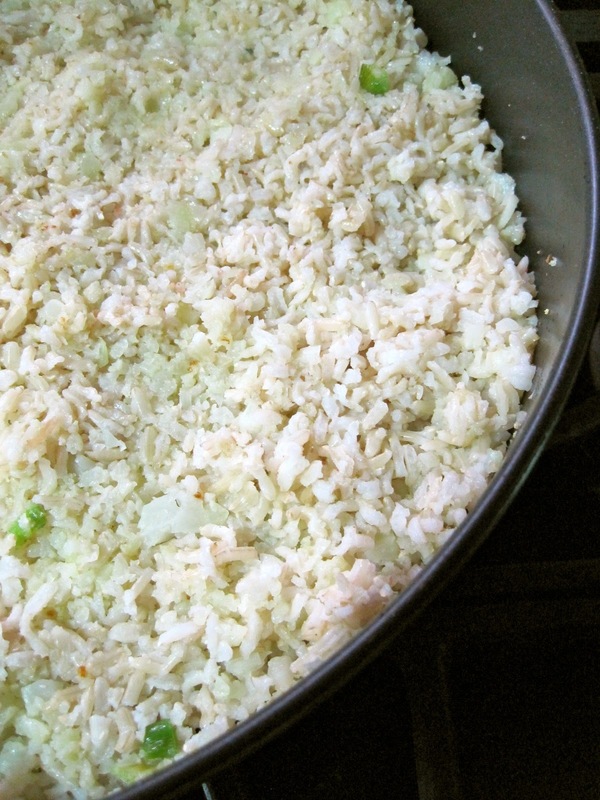 Let it sit for about two minutes—so the rice can get toasted and a little crispy. Add the peas and broccoli and stir again. Drizzle soy sauce and toasted sesame oil over rice. The frozen peas will thaw when they're tossed with the steaming hot rice. You can use cooked broccoli or thawed frozen broccoli. Cook for another minute or so and turn off heat. 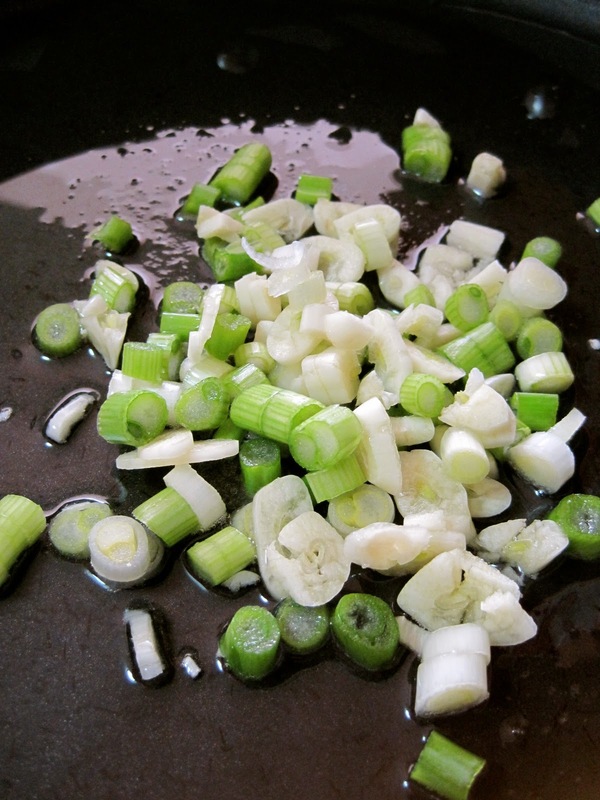 Add chopped scallion tops and toss. I like to toast some sesame seeds in a dry pan; I sprinkle these and some more raw, chopped scallion over the top of the rice for added flavor and crunch. Season to taste with salt and, if you'd like, more soy sauce. Keep in mind that if you're serving this with something salty and saucy (ie. teriyaki chicken) you may want to hold off on adding too much salt to the fried rice. 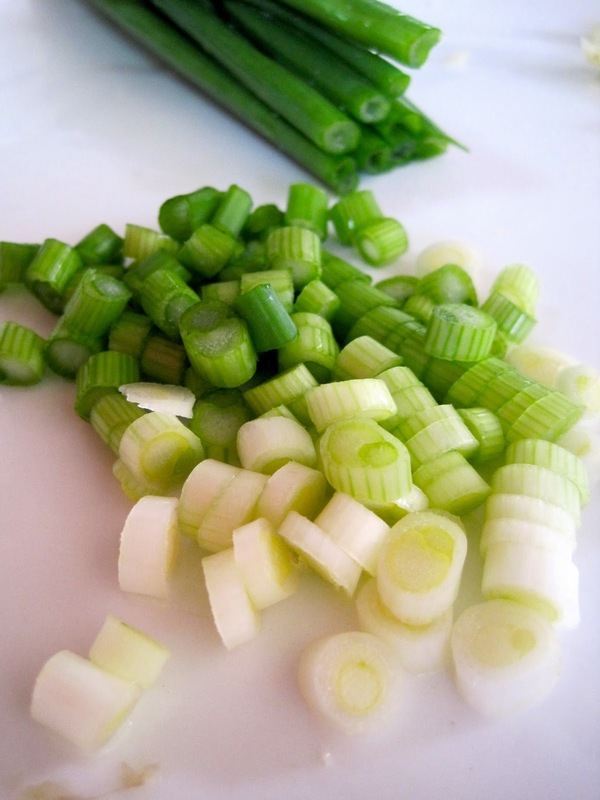 Dig in, knowing that more than half of your serving of fried rice is actually veggies! Can you tell where the brown rice ends and the cauliflower begins? Me, neither. If you end up with leftovers (we usually don't) try this: Leftover Fried Rice? Put an Egg On It! If you try this recipe out on your family, let us know what they (and you) think! UPDATE: The Fountain Avenue Kitchen tried this recipe, loved it and wrote a whole blogpost about it! We're so grateful. UPDATE: Cupcakes & Kale Chips made a version with shrimp and pork that looks lovely. This looks phenomenal and I can't wait to try it! Do you have the Super Natural Every Day cookbook? She has a great recipe in there using cauliflower "rice" too. It's a genius trick to me! Yeah, the cauliflower popcorn is hard to beat! But this is good, too, I promise. Report back if you try it! Just made this tonight and it was so delicious. Cannot wait to make again! This is the second time I have seen this today and it sounds wonderful. I was thinking I needed to get a ricer to do this, but glad to see you could do that in your food processor. I definitely need to try this. Love cauliflower and fried rice! Thank you for trying it! Glad you enjoyed it. I love Cauliflower, broccoli and fried rice! Can't wait to try this, pinned it! One of my kids favorite meals in my stir fried brown rice with chicken and veggies. They're not big cauliflower eaters, but they just might enjoy it in this rice dish. Looks delicious to me! 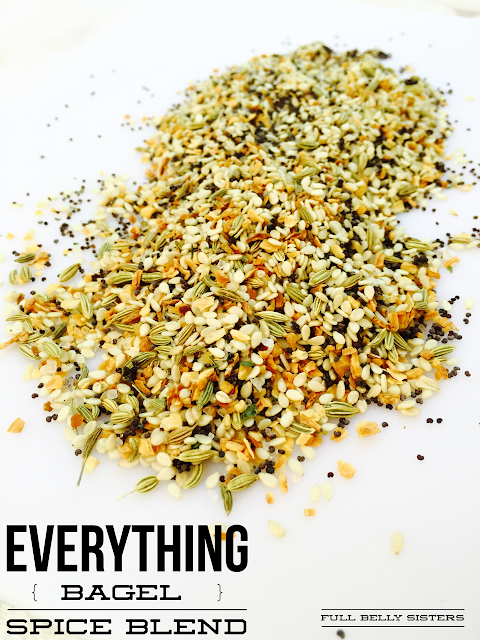 This is such a great recipe that I've adapted a little bit for my rice-free family. We use cauliflower "rice" and I add frozen shrimp to it along with the peas to make a whole meal. I just had this lunch today and I had left-over roasted brussel sprouts in lieu of your broccoli. Hey, a girl has to clean out her fridge somehow, right? Thanks for posting this tasty idea. It is such a fun way to serve cauliflower. YUM! I love the idea of the brussels sprouts - like cauliflower, it's one of those veggies I learned to love as an adult! Thanks for posting your review. Needed to draft you the bit of note to finally thank you so much again on your fantastic guidelines you've discussed on this site. It's simply pretty generous of people like you to allow unreservedly precisely what a lot of people could possibly have supplied for an electronic book to end up making some money for themselves, and in particular seeing that you might well have tried it in the event you considered necessary. The techniques as well served like the easy way to recognize that the rest have similar keenness just like my very own to see a good deal more around this problem. I'm sure there are thousands of more pleasurable situations up front for people who check out your website. no one was the wiser...so tasty too!! This is the best recipe in the world. I made it for my family and everyone loved it, even my 10 months old baby!! This is definitely going to make my list of things to make every week. It is so easy, healthy, and delicious! Thank you Full Belly Sisters for this. The pina kale-ada smoothie is fabulous too. I can't wait to try more of your recipes!! This is the best *review* in the world! Thank you so much for taking the time to post it here - such a thrill to hear your positive feedback. And i love picturing your baby trying to wrangle it all into his (or her?) mouth. So sweet. PPS. Glad you like the Pina Kale-ada, as well! Made this for my better half as a Valentine's treat. She goes as crazy for this as a thick juicy steak (her favorite or used to be!) I love it too and I'd be surprised if you didn't too. Give it a try and let us know if your family discovers the cauliflower. So glad you both like it so much! I made your cauliflower rice the other night and it was delicious! I didn't have peas so I just used more broccoli. I also added toasted cashews for a little crunch. My 3 year old helped chop up the cauliflower in the food processor and ate three helpings herself! Thanks for such a great recipe! Thank YOU for trying it and for coming back here to post a review - we greatly appreciate it! Wow, this dish looks really amazing! I love cauliflower and broccoli, so your recipes shared at Fit and Fabulous Fridays are right up my alley!! :) A great healthy twist on fried rice. Perfect! Yippee, let us know when you try it! I made this last night, and it came out amazing. This recipe is genius! It was so good that my husband even loved it, and he's not much of a healthy foods guy. Thanks so much for coming up with such a great way to add even more veggies to a dish! Really appreciate your trying it out AND reporting back on how you liked it! Whipped this up tonight and wow, so good! Love the flavor and the husband enjoyed it too! We'll definitely add this one to the rotation. Feels so good to eat something so full of veggies that's not a salad. :) Thank you! Not that I don't like a good salad, just nice to have other options! Especially warm ones! So, so glad you both liked it! And I really appreciate that you came back to post your review - thank you. I made this a few days ago and it was great. My son does not like cauliflower, but he had no idea that it was mixed into the dish. I did not use peas or broccoli, but added different vegetables. Thank you for the recipe! So happy you liked it and I really appreciate your posting a review! This is an awesome recipe! I'm definitely making this, I love cauliflower rice! Made this tonight using pineapple in place of the broccoli, added egg and Sriracha sauce. It was amazing! My 14 mo. old loved it and DH went back for more. Said it was the most cauliflower he had ever eaten. Janelle made this for me and her Grandpa and it was absolutely awesome! Thank you for this recipe. I'm sharing this on my page and featuring it on my News of the Day. I'm going to make this tonight. Can't wait! One question - what does 1+1 T mean? Basically that you're using 1Tablespoon at the start of the recipe and then one later on the recipe. It just means that you're adding one at one point in the recipe and one later in the recipe. Hope you like it! Thank you and also (duh!) on me. We loved it. I agree with this being the best!!! My 4 kids gobbled this up in a matter of seconds. No one knew it was anything other than rice until I told them....after their second or third helping. I did double the recipe and made A LOT but there was still no leftovers. I was hoping there would be some left to give to them for lunch tomorrow. Oh well, guess I have to cook again. Thanks for this AMAZING recipe. Even my hubby loved it. WOW, thanks! So glad your whole family loved it - and I'm so glad you took the time to come back and post a review! Fabulous, so glad to hear how much you like it! So glad you like it and I SO appreciate your coming back to write a review - thank you!! My mouth was doing the happy dance! My god, this was good!!! A - MAZ - ING!!! This is super yummy and pretty simple to prepare! I had everything on hand already ...thanx full belly sisters, you rocked my world! Thanks FBS. I have to make fried rice for my husband on a regular basis...and his belly shows it :). I think it's time to mix it up a bit with your GREAT idea !!!!!! I hope it's a hit with your hubby! I finally got around to making this--it is amazing! My kids scarfed it down. Adding it to my list of favorites!